Background: Dodonaea angustifolia is used in Ethiopian traditional medicine to treat malaria. The objective of this work was to conduct bioassay guided fractionation of the leaves of D. angustifolia using Plasmodium berghei infected mice. Method: The antiplasmodial activity of the extracts and pure compounds was evaluated using the standard Peter’s four-day suppressive method. The structures of isolated compounds were elucidated using chemical and spectroscopic methods. 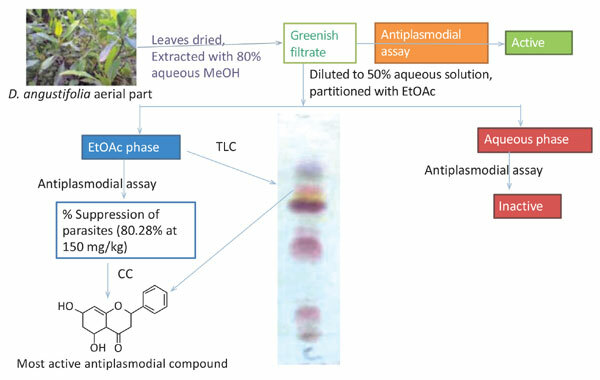 Results: In this study, the ethyl acetate soluble portion of the 80% aqueous MeOH extract of the leaves significantly suppressed parasitaemia in Plasmodium berghei infected mice (80.28% at 150 mg/kg). Three active compounds which exhibited significant percent suppression of parasitaemia by 81% at 40 mg/kg, 80% at 50 mg/kg and 70% at 40 mg/kg, respectively were identified. These are the flavanone pinocembrin (1), the flavanol santin (2) and the clerodane diterpene 2-hydroxy-15,16-epoxyceloda- 3,13(16),14-trien-18-oic acid (3). Under similar conditions, chloroquine suppressed parasitaemia by 100% at 25 mg/kg. Chemical study of the ethanol extract of the leaves yielded 5,7,4'-trihydroxy-3,6- dimethoxyflavone (4), ent-16-hydroxy-labdan-3,8-dihydroxy,13(14)-en-15,16-olide (5) and 5,6,7- trihydroxy-3,4'-dimethoxyflavone (6). Compound 6 has not been reported before as a natural product. Conclusion: From the leaves of D. angustifolia, three compounds with significant antiplasmodial activities were isolated and characterized, with pinocembrin as the most active compound. Keywords: Dodonaea angustifolia, Plasmodium berghei, pinocembrin, santin, anti-malarial, diterpene, flavonoid, Sapindaceae. Keywords:Dodonaea angustifolia, Plasmodium berghei, pinocembrin, santin, anti-malarial, diterpene, flavonoid, Sapindaceae. Abstract:Background: Dodonaea angustifolia is used in Ethiopian traditional medicine to treat malaria. The objective of this work was to conduct bioassay guided fractionation of the leaves of D. angustifolia using Plasmodium berghei infected mice.